This Jaguar is on steroids! The F-Type I drove was the handsome 2.0-litre Coupe R-Dynamic, in red, which got me red-carpet treatment just about everywhere I went! And, I am not complaining! The first thing that will grab your attention on this iconic car is its massive 19-inch, seven-split-spoke set of wheels. They give the car a solid road presence. The re-designed front bumper, the LED headlamps, the rear spoiler and the shark-fin antennae further add to its sporty appeal. It must be said right away that the ingress and egress are not the best we have seen because of the deep foot well of the car. Unless you have the fitness levels of Novak Djokovic, you are going to find it a tad bit difficult to get in and out of this car, especially if you will be using it a lot in the city for quick runabouts. Having said that, a great deal also depends on the seating position you have programmed in the car’s 12-way electric front seats with memory. Once inside, you will certainly appreciate the clever details and loads of equipment and features that the car comes loaded with. Whether it is just seeing the way in which the steering (it comes with an electrically adjustable steering column with memory) and the seat adjust to your body position, or the manner in which the air con vents slide up (and go back in, when you turn off the engine), it is all pure drama, to say the least. The Meridian sound system isn’t too bad, and the car’s auto dimming ORVMs will definitely take some getting used to. Sheer exhilaration is felt even at the slightest press of the throttle thanks to the loud 2.0-litre (1,997cc) four-cylinder petrol engine. The car belts out a maximum power of 221kw at 5,500rpm. It comes with an eight-speed automatic gearbox. The handling and performance are just what every sports car ought to be like thanks to the well-balanced aluminium chassis. Whether you are throwing it into corners or simply driving on a straight road, you are certainly going to enjoy every bit of your driving experience because of the splendid manner in which the car responds. At times, I did find the seats slightly stiff, but usually they provided adequate support. 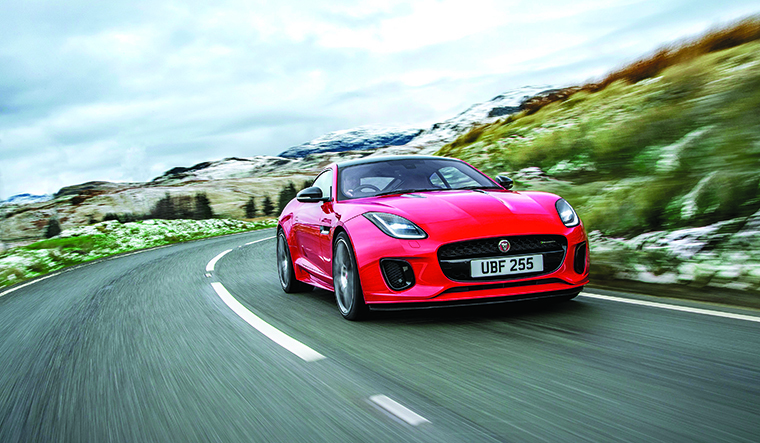 The Jaguar F-Type is both a looker and a performer. The pressing question, though, is will we see Agent 007 driving this one? James Bond’s last outing, Spectre, had a Jaguar C-X75 chasing him around in Rome.